The blaze broke out at the village school on Saturday evening. A village school has been badly damaged by a huge fire. 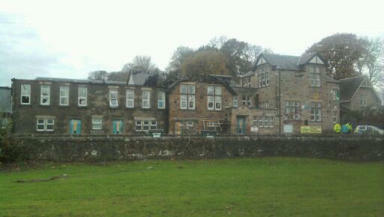 Firefighters battled the blaze at East Plean primary, in Plean, near Stirling, throughout Saturday night. They were called to the scene of the fire, on the village's Main Street, at around 8.10pm on Saturday evening. Local residents told STV News the school's roof had collapsed and windows blew out. Emma Duff's son, Thomas, is in primary four at the school. She said: "It's very, very sad, seeing your child's school on fire. The roof of the infants' section was ablaze and there were orange flames everywhere. "I was at a family bonfire nearby and we found out about the fire at about 9pm. We could see the smoke from my parents' house. We walked along to where the road was cordoned off - the whole village was there. "The whole roof was gone and the windows were coming out. The inside must just be a shell at the moment." At its height, some 40 firefighters were battling the blaze. It is understood that Central Scotland Fire and Rescue Service officers from across the area were called to the scene to tackle the fire. Children in the Stirling Council area are to be off until Wednesday on in-service days. A public meeting was held on Sunday afternoon to update residents, with local councillors and the area's head of education Belinda Greer among those attending. STV News understands that council officials are set to hold another meeting on Monday morning to discuss plans for the school's pupils and that the meeting was told that efforts were being made to try to ensure the children continued to be taught together, with the main focus on keeping disruption to a minimum for them. A further public meeting is to take place on Wednesday evening at 7pm in the village's Balfour Hall to update parents on the arrangements for their children's return to school. A spokeswoman for the fire service confirmed: "On arrival, crews were met with a developing fire in the school, which has required the attendance of 40 firefighters and officers." The A9 through Plean was shut overnight as a result of the blaze, which was brought under control shortly after 5.30am on Sunday. Firefighters said the cause of the blaze was currently unknown and that nobody was injured. Central Scotland Police are investigating. The school was built in 1874 and was refurbished in 2000, with a nursery school being added to the building. Its roll was around 150, with a further 40 nursery pupils.